Published by frgee on Thursday, January 20, 2005 at 9:29 PM. we are now awaiting the arrival of a 24 person medical group, two translators from the capital, and a new volunteer, julia, who will teach english in the school and to the townsfolk at night. Published by frgee on Saturday, January 15, 2005 at 8:25 AM. 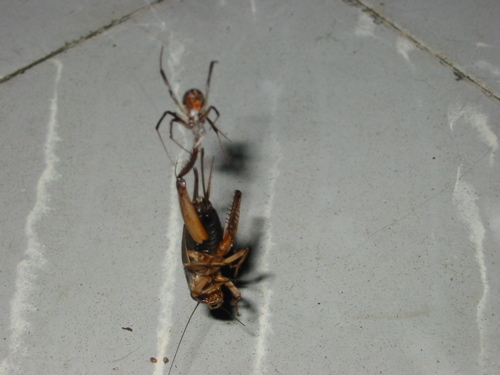 here's a nice national geographic explorer shot of a spider taking down a cricket under a chair in my office. Published by frgee on Tuesday, January 11, 2005 at 7:12 AM. what a trip - i think we hit 5,000 feet, but i've misplaced my gps, so no accuracy there other than the old internal altimeter...here is a nice shot from a mule's back as we traversed a ridge. 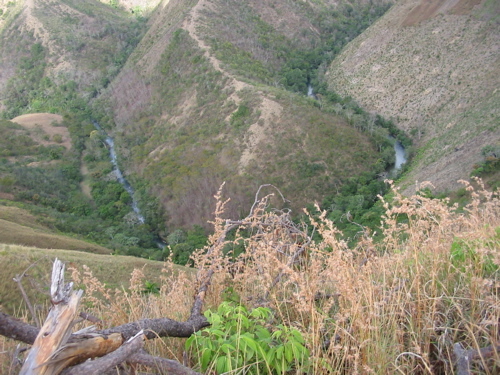 way down below, our destination, is the rio joca - clear and cool. and, before i forget, after i arrived home last night, around 8:30 pm, a woman came to me crying and told me that her pig was in jail. literally, as in under lock and key in the police station. it had gotten out and eaten the neighbor's flowers. i learned that the local fine was 100 pesos to have the pig freed from it's cell. Published by frgee on Friday, January 07, 2005 at 11:54 AM.